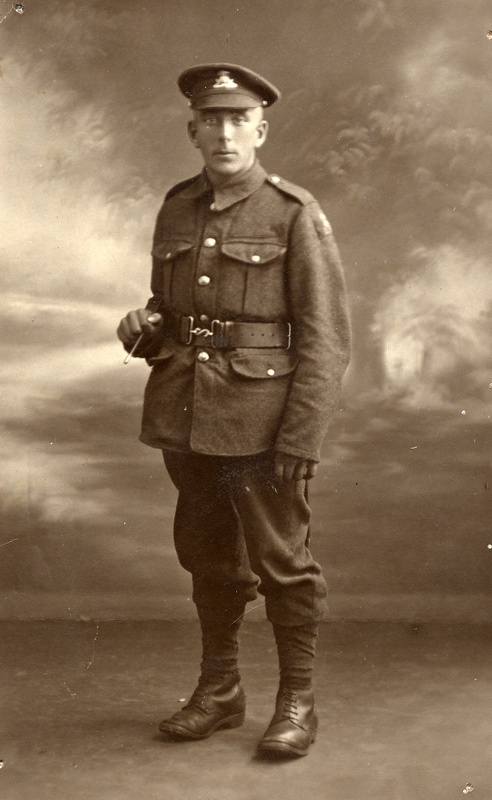 A photograph from the family archive believed to be Pte Henry Box, taken perhaps in 1918. His cap bears the characteristic badge of he Lancashire Fusiliers. A description of the action at Neuvilly, from the London Gazette, 14th December 1918, page 14778. Henry James Box junior was the oldest child of Henry James Box, a jockey born in 1874 at Alresford, Hampshire, and Mary Louisa Box, born in 1874 at Newton Stacey, Hampshire. Henry and Mary married in 1894. The census of 1901 records the family living at Church Lane, Bishops Sutton near Alresford, Hampshire. At this time, in addition to six year old Henry James junior, there were three younger children, Charles Frederick (aged 4), Evelyn (2) and Victor Robert (less than 1 year old). By 1911, they had moved to Aslockton, Notts, where Henry (senior) and Mary had six children at home: Frederick (14, now working as a groom), Evelyn (12), Victor (10), Livorno (a girl also known as Winifred, aged 9), Reginald (7) and Louis (1). All children had been born at Bishops Sutton except for Louis, who was born at Aslockton. Henry junior was no longer at the family home, having left to work as a farm servant. The census of 1911 records Henry James Box junior, aged 16, a farm boy working at Brocker Farm, Bingham, the home of farmer Richard Brown and his family. Henry James Box senior died in 1947 and was buried on the 10th June, 1947, at Bottesford. The War Memorial at Orston records that Henry Box was a Private in the Lancashire Fusiliers. Records confirm that he served as 27928 Private, 9th and then 10th Battalions, Lancashire Fusiliers, and had previously served as 23872 Kings Own Yorkshire Light Infantry. When he was killed he was part of the 10th Battalion. There is a Hospital Record indicating that Pte 27928 Henry Box was severely injured on the 18th August, 1917, while with D Company, 9th (Service) Battalion of the Lancashire Fusiliers. That day he was admitted to No. 64 Casualty Clearing Station with “Gunshot wound I.1 and II.1, eye, left, severe”, “Gunshot wound of the head. Contusion or simple flesh wound of the scalp”. He came through, and on the 26th August was at No.6 Convalescent Camp. On the date of his injury, his Battalion was part of the 11th Division, in the Battle of Langemarck, part of the Third Battle of Ypres. This record also tells us that he had been in the army for two years, and part of the “field force” for fifteen months. 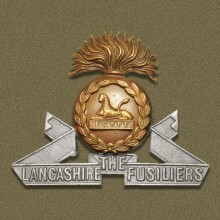 However, it is not clear when he tranferred from the KOYLI and became part of the actions fought by the Lancashire Fusiliers. The 9th Battalion of the Fusiliers fought in Gallipoli and Suez in 1915, before joining the Western Front in 1916 and taking part in the Battle of the Somme and then in June 1917 in the Battle of Messines. In August 1917 it was involved in an indecisive action at Langemarck, part of the Third Battle of Ypres, where he suffered his injury. It may be that he was transferred to the 10th Battalion on returning to the front following his eye injury and convalescence. The 10th was part of the 17th Division, and fought through the Battle of St Quentin in March 1918, followed by Bapaume and actions known as the Battle of the Hindenburg Line, which included the Battle of Cambrai which started on the 8th October. On the 10th October the 17th captured enemy positions at Neuvilly, SE of Cambrai, but this success was only temporary, and Neuvilly was not finally taken until the 17th October. 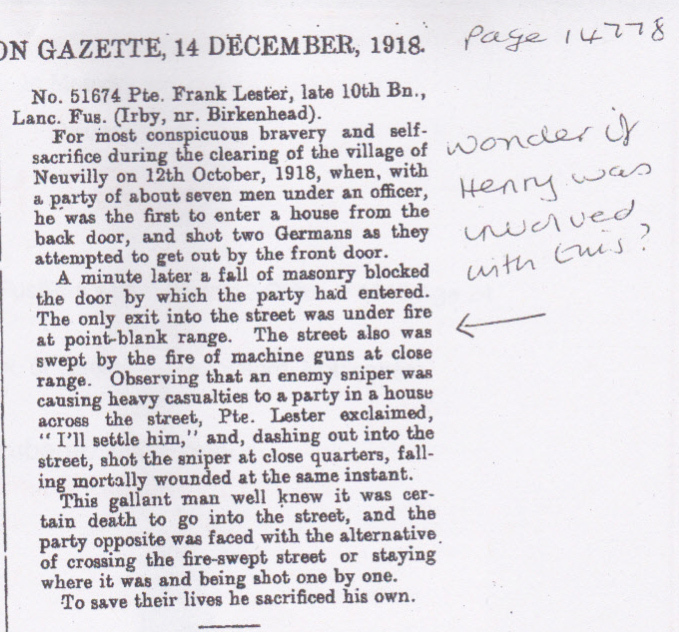 Henry Box was Killed in Action on the 12th October, during this action. The fighting at Neuvilly appears to have been intense, involving hand to hand street fighting. 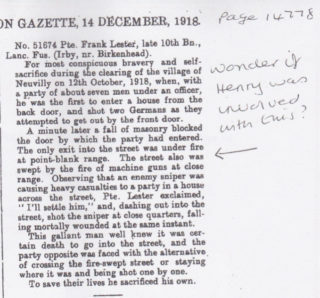 Janet Dammes is thanked for pointing out that the vivid description of the fighting in the obituary notice marking the death of Pte 51674 Frank Lester, V.C., of the 10th Battalion, which was published in the London Gazette, 14th December 1918. Harry Box would have known this brave soldier, and might have been involved in the same incident, though there is no confirmation of this. Henry’s brother, Charles Frederick Box, joined the Army Service Corps. He survived the war, and in 1920 married Dorothy Drew Frisby. He then emigrated to Canada, and died in Calgary. Commemorated on the War Memorial at Orston, Nottinghamshire.